Last week, I placed all the work I'd been creating on the floor and took a picture. I like to see the immediate environment around a group of pieces, as they'll usually share colors, symbols, or even bits of style that changes with each idea. I also like being able to answer the inevitable question of, "Oh, wow, you're an artist? What are you working on?" With one pic. Plus, I see how much I'm creating, and see where my attention has been and make changes if necessary. I wrote this thought in my journal while out for coffee and a bit of art journaling in public. I can't remember exactly what songs I was listening to, just that I felt a sudden swell of this need to be open more, with my heart and mind, because I feel a stronger, wiser girl lives within, under all the layers of muck. We all have secrets buried deep down inside. And not the kind that leads to treasure or arrests being made, but these internal morals and bedrocks of our personality that we feel we can't share with anyone because it wouldn't be accepted, or maybe it would be ignored. Maybe I'm looking for the word conviction - it is this enviable way of being that others carry so well. All I know is this: I feel like there's a blockage inside of me, and I know those secrets and truths that are blocking the way. I can recognize that some of them may not necessarily be accepted by society, and others terrify me as praying out loud does the first few times you do it. Even if no one else thinks it's embaressing, it is! I hope I'm describing this somewhat well, because I don't know how to, really. I'll have to work on some doodles to see if I can make art to help. For example, I really want to become an artist advocate for those with chronic illnesses. I want to create art and support groups, get out there meeting others and really developing a program for us. I want to help others with TBI find their way back home through art. I want to fully emerce myself into my ME-NESS and really let it all out I a totally creative way. I'm getting there. In more ways than one. I'm currently working on my bravery (and new anxiety!) to really BE AN ARTIST and part of the community in the greater Phoenix area. That's why she has wings on her head. I'll be filling her in this weekend, my beacon. 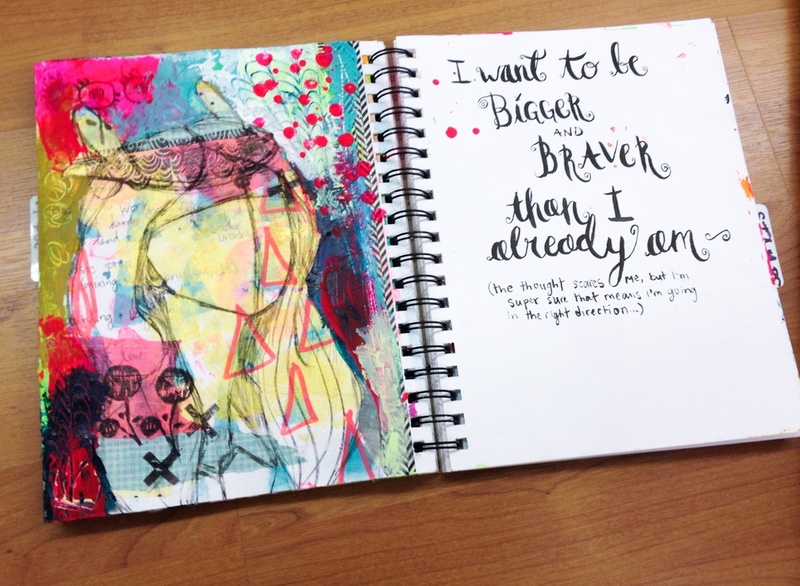 How do you want to be braver? I'd love to hear from you!